It’s Tu Bishvat (also spelled Tu B’Shevat) – the birthday of the trees! And we are celebrating this year with the folks at Jewish National Fund and a brand new, one-of-a-kind babka made with the “seven species.” The Jewish National Fund is actually the original “tree people” and to date have planted 240 million trees in Israel, making Israel one of only 2 countries to enter the 21st century with a net- tree gain. The seven species actually comes straight from the Torah: wheat, barley, grapes (or wine), olives (or olive oil), pomegranates, dates and figs. It is traditional in some communities to host a Tu B’Shevat seder, where these foods are enjoyed as part of a Passover-like seder. 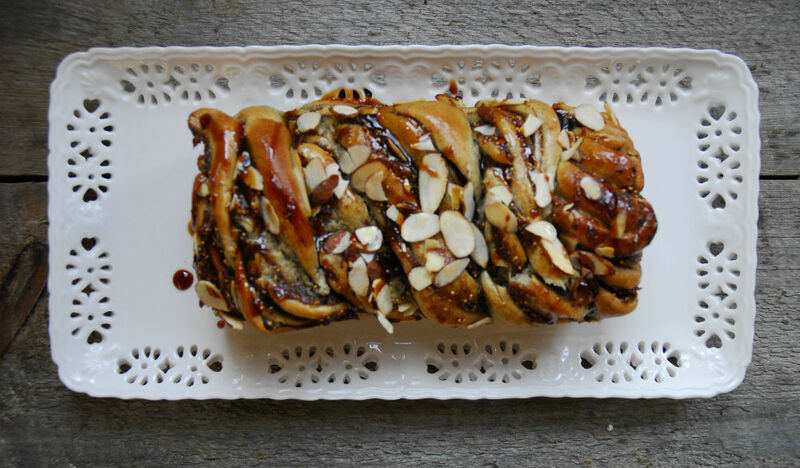 To participate in Tu Bishvat Across America check out Jewish National Fund’s website and consider planting a tree, hosting a seder or baking up one of these delicious babkas. (It tastes like a sophisticated Fig Newton!) And if you purchase a tree this Tu Bishvat with The Jewish National Fund, you will be entered to win a trip to Israel. See our short video below about Tu B’Shevat and this special holiday babka. In a stand mixer fitted with dough hook or a large bowl, mix together flours, sugar, vanilla and cinnamon. Start with 3 1/2 cups of flour, and add more later if dough seems too sticky. Add milk and olive oil. When the dough begins to come together, after about 3-5 minutes, turn out onto a floured surface and knead vigorously for 5-10 minutes. Or if using a stand mixer, switch to high and mix another 4-5 minutes. Dough should be shiny, elastic and very soft when it is done. If dough is sticking too much, add more flour 1/4 cup at a time until dough is not longer sticking. Place dough in a greased bowl with a damp towel on top. Allow to 1-2 hours. Combine all filling ingredient in a saucepan over medium heat. Bring to a boil, then reduce for 10 minutes, until liquid has reduced to slightly more than half. Allow to cool slightly. Place in food processor and pulse. *Note: you can also replace filling with store-bought fig jam. 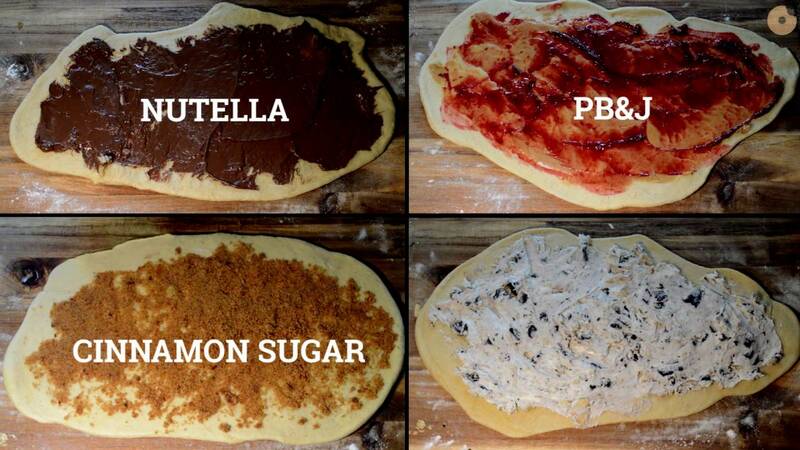 Cut dough into two parts. Roll out each section of dough until it is a rectangular-like shape. Spread with filling. Working from the shorter side, roll up dough using quick fingers, like you would in order to make cinnamon rolls. Place in a greased loaf pan. Allow to rise another 10-20 minutes. Sprinkle top with slivered almonds if desired (this step is optional). Top with date honey if desired.